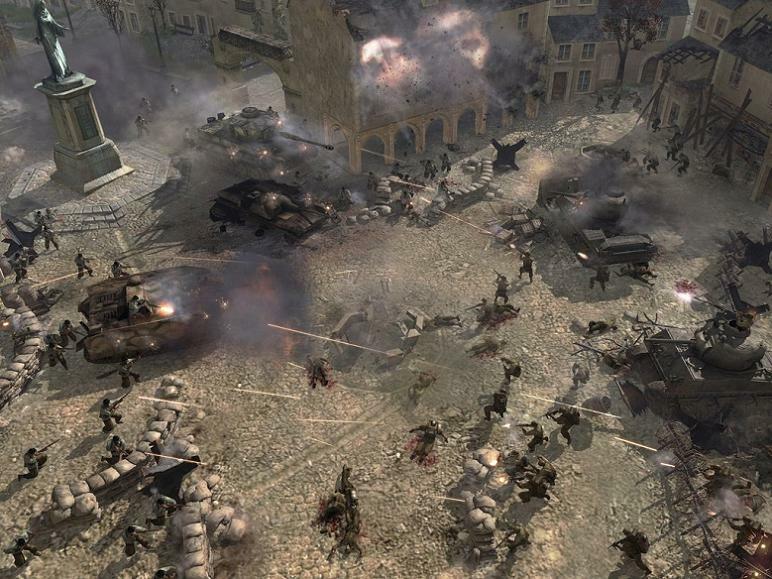 Company of Heroes was runner-up for Direman Press 2006 Game of the Year, and nearly two years later, continues to be one of the most vital PC games this side of the millennium. It refines the innovations introduced in Relic's previous game, Warhammer 40000: Dawn of War, and injects them into a (I hate myself for using this overused word) gritty World War II setting coupled with an unparalleled level of polish. Company of Heroes is the most significant Real Time Strategy game since 1999's Age of Empires II, and has earned the right to be favorably mentioned in the same sentence as StarCraft. Two innovations stand out in particular. Firstly, you don't have to worry about hyper-managing peon driven economies. There are no militarily useless ant trails of miners and lumberjacks in Company of Heroes. Instead, infantry units seize strategic points that supply a flow of industrial resources. In addition, these points must be linked together to form a contiguous chain of supply, resulting in a simple and excellent abstraction of the foremost strategic concern of warfare. If the line of supply is broken, the stranded strategic point no longer grants you resources. In multiplayer games, hamstringing your opponents by severing their shared resources is a crippling stratagem. Secondly, Company of Heroes features a robust emphasis on combat orientated tactical play over rote build order and amassing of units. First person shooters have been embracing the "find, fix, and flank" basic military doctrine for some time, but Company of Heroes is the first RTS to implement it in any meaningful fashion. A cover system for infantry provides for considerable tactical implications when engaging the enemy. Toss in the suppression ability of machineguns and the dislodgement power of mortar crews, and infantry combat alone becomes a satisfyingly complex experience. Vehicles completely shift these balances of power. Halftracks and armored cars can annihilate light infantry, and tanks are fearsome engines of destruction. It's a momentous event whenever a heavy American Pershing or German King Tiger hits the battlefield. Even still, riflemen with sticky bombs or Panzerschrecks are capable of destroying heavy armor if employed judiciously. This necessitates supporting vehicles with infantry to protect them from anti-armor weaponry. At the same time, bunching them all together provides a juicy target for artillery fire. The resulting interplay of combined arms is a significant step forward for the genre. Previously, tactical concerns were limited to paper/rock/scissor formulas of how to effectively counter enemy units. Now, not only is it important to know what units to deploy, it's vital to understand how to deploy them. "Tech trees" have also been streamlined. Each faction only has a handful of manufacturing structures, so it doesn't take long to memorize the entirety of their arsenals. There's no need to put up a mind wracking poster of radiating research branches in the bathroom to ponder while you do your business. This isn't to say that Company of Heroes is overly simplistic or without options. You earn experience as combat progresses, which can be spent to gain access in one of three military doctrines. For example, should the Americans find themselves with an opportunity to strike deep into enemy territory, the Airborne Doctrine allows them to directly drop in paratroopers and anti-tank guns and back them up with air support. If they find themselves mired in a battle for tank supremacy, the Armor Doctrine can provide an edge against the otherwise superior Axis heavy armor. Each faction has access to three such unique doctrines that can be tailored to suit both general strategy and battlefield necessity. Company of Heroes delivers these innovations via unparalleled presentation. Relic is one of those rare developers (Monolith being another) that know how to convey impact and force in a visceral manner. It's in the details, from the distinct audio pop of a single rifle to the chaotic screen-shaking of a howitzer barrage. The Havok physics engine, while over-exaggerated, handles detailed animations and beautifully deteriorating structures. All of the bleeding edge graphical goodies, from dynamic lighting to normal mapped textures (and now DirectX 10 support), are gorgeously utilized. Company of Heroes also scales well; if you only meet the minimum requirements, it won't be as attractive, but it'll still run smoothly without negatively affecting playability. The only major drawback of note is the limited number of factions. It's limited to just two (Americans and German Wehrmacht) in the core game. I strongly recommend you purchase the "Gold Edition" which includes the Opposing Fronts expansion. This opens up the British and the German Panzer Elite and their excellent single player campaigns. Even still, the variety of match-ups is stifling compared to other faction-rich RTS games, particularly because you can't (for obvious reasons) team together an Allied faction with an Axis one. Unit pathfinding is also problematic. I've lost a match or two because I lazily automated my squads, and they failed to navigate their way to essential objectives. Nevertheless, this is a quibble, since this issue continues to universally plague RTS games. Unit balance isn't quite perfect either, but successive patches continue to refine these relationships. Company of Heroes is a genre-defining masterpiece that excels in both concept and execution. It's a tightly focused experience that eschews unnecessary minutia in favor of direct confrontation. Company of Heroes is sure to please everyone from history buffs to RTS fanatics, feeding the fantasies of all armchair generals. Flat out, it's one of the very best of all time. I skipped on reviewing the first expansion set, Opposing Fronts, because I felt it to be indispensable to the Company of Heroes experience. So much so that I considered them to be a single integrated product for the sake of review. Tales of Valor, on the other hand, feels like unrelated bits of overgrown Downloadable Content packaged together as a full retail product. This is the sort of stuff that companies like Valve or Epic would slowly dole out to us for free. It's not terrible material by any stretch, but it's not cohesive, and the whole feels like less than the sum of its parts. The content of Tales of Valor just isn't important, and doesn't work as a full-fledged release. Tales of Valor adds no new factions. Instead, we get a couple of new maps, and a handful of new units of dubious usability. Even without new factions, Tales of Valor could still have delivered a full expansion experience if it had simply provided a much vaster array of these new units. Gamers would be forced to select their available unit types before entering a match. This would have resulted in a degree of customization and meta-game match-up strategy unseen in the RTS genre. Instead, the few new units are pieces of fluff with negligible impact on the game. The new campaigns are tiny vignettes, unlike the sprawling epics of previous Company of Heroes narratives. Tales of Valor presents three of them, but they consist of only three missions each. The conflicts in these scenarios are unimaginatively designed and unbalanced. The first two campaigns are a cakewalk, while the third is overly punitive. In addition, they feature a profound shift toward the micromanagement philosophy of Relic's other recent RTS, Warhammer 40,000: Dawn of War 2. I strongly feel that this approach fails here. Whereas Warhammer is driven by grandiose, bigger-than-life classically heroic figures, Company of Heroes is about war, and the brave everymen who wage them. It's as if the two games have their names reversed. I play Company of Heroes to experience the broad sweep of battle, and the COMPANY of soldiers who fight together, not to micromanage a single tank with half a dozen specific abilities to juggle. The bulk of Tales of Valor's content comes in the form of new multiplayer modes. "Assault" has up to six players (three on three) each controlling a single hero. They are pitted against each other in a battle to break hard points, allowing NPC soldiers to push forward. These heroes gain experience as the match progresses, giving them access to various powerful abilities. For those of you familiar with this reference, it is reminiscent of the "Defense of the Ancients" mod for Warcraft III. "Tank War" is a similar game mode, with the obvious difference of controlling a tank instead of an infantryman. These two modes failed to hold my attention. The idea of immensely powerful individual heroes can be stirring in a mythological setting, but feels incongruous within the rigors of fairly modern warfare. The third mode, "Stonewall" fares better. It's a co-op mode for up to four participants that involves surviving wave after wave of invading enemies. It's tense, unrelenting, and requires coordinated teamwork to successfully hold your town. Unfortunately, it's also repetitive. After beating it a couple of times, I've only revisited it once, at the behest of one my friends. Tales of Valor provides nothing essential. It consists of exploratory extensions that could have been provided as downloadable content. Some of its elements are interesting, but combined together as an expansion pack, it fails to provide neither relevance nor the justification for a full retail price point.